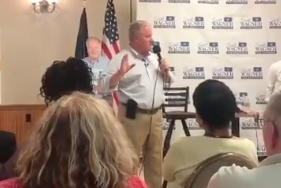 Gubernatorial candidate Scott Wagner at a town hall meeting, where he called young activist Rose Strauss "young and naive" after she questioned Wagner's stance on climate change. At a town-hall meeting earlier this month, an 18-year-old environmental activist and student at the University of California was called "young and naive" by Republican candidate for governor Scott Wagner after the activist, Rose Strauss, asked Wagner about his views on climate change. "My name is Rose, I'm 18, and I'm really concerned about the future of our country," she says at the mic. "Two-thirds of Pennsylvanians think climate change is an issue that needs to be addressed, and you've said that climate change is a result of people's body heat and are refusing to take action on the issue." She goes on: "Does this have anything to do with the $200,000 you have taken from the fossil fuel industry?" To which Wagner responds, "You're 18 years old. You know, you're a little young and naive." Then, you can hear the crowd laughing. A video of their exchange was taken by Sunrise Pennsylvania, a local branch of the Sunrise Movement, which is an organization mobilizing young people around climate change awareness and job creation. Wagner's response to Strauss quickly went viral, and the hashtag #YoungandNaive was widespread on social media. The New York Times interviewed the young activist and she penned an editorial in Teen Vogue about her commitment to getting politicians that often dodge questions regarding climate change on the campaign trail. "If you are #YoungAndNaive too, join me in telling Scott Wagner to return the $200,000 he has accepted from Big Oil and reject their contributions in the future," she wrote for Teen Vogue. "It’s only by working together that we can make the sun rise on a new era in Washington." In the end, Wagner didn't answer the question and suggested they "talk about something else," even after multiple people in the audience yelled, "Answer the question!" Then, Wagner said, "Are we here to elect a governor or are we here to elect a scientist?" In March 2017 the gubernatorial candidate made some controversial comments about climate change at a gas conference in Harrisburg, essentially saying that warm bodies cause climate change. He said, "the earth moves closer to the sun every year — you know the rotation of the earth. We're moving closer to the sun." But then: "We have more people ... you know, humans have warm bodies. So is heat coming off? Things are changing ... but I think we are, as a society, doing the best we can." John Oliver had something to say about this at the time. Anyways, there has been a lot of social media support for Strauss and her being #YoungandNaive on social media. Below are a few posts. If being young and naive means wanting action on climate to protect the health and safety of millions of people around the world, then call me #YoungAndNaive.